2016 Malat, Gruner Veltliner, Crazy Creatures, Kremstal, Austria. Michael Malat is a new star in the Wachau and his Gruner is a wine to check out, and I am diving into his playful entry level estate Crazy Creatures series Gruner Veltliner, which have a set of 4 different collector edition labels and come from his vines in the Kremstal DAC near his village of Palt. All of the state owned vines are farmed organic and with ultra sustainable methods to promote environmental health of the vineyard, plus both human and animal life, his Crazy Creatures Gruner is an all stainless steel ferment and aged example with clear persistence and purity, the vines are from two main plots in Part and Furth grown on the regions classic loess and loam as well as primary rock soils with all the grapes hand tended and picked. Malat does Cru (Gruner) versions from some unique sites including some with schist, sand and limestone, some are Erste Lage and very serious, as well as a Pinot Noir, which already has a following, much like Loimer. 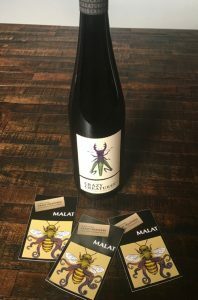 Malat’s wines are heavily influenced by the Danube and enjoy warm days and cool nights that produce a notable spicy character as well as a brisk intensity, while the Crazy Creatures captures that it is a lighter and refreshing style made to be enjoyed immediately upon release, it is dry, but generous on the tangy palate and looks to be a great bistro white as well as great with lunch and or lighter fare meals including sea foods and is an easy summer quaffer. Gruner Veltliner, a natural cross of non aromatic Traminer and St. Georgen, is Austria’s signature white varietal and it accounts for 30% of the total vineyard area in Austria, it’s most grown in and around Vienna, with the Wachau and Kremstal, Kamptal and the Weinvertel being a few of the main areas to look for on the labels. The 2016 Crazy Creatures Gruner is bright and zesty with classic lemon/lime, almond, pithy peach and white pepper in a crisp light form with a hint of herb, wet stones and faint apple. Nicely dry and brisk it gets a bit more textured with air, it is 12.5%, so there is some substance there under the juicy acidity, making it well balanced and easy to love, this is well made and fun, drink over the next 2 or 3 years.